Working in Professor Stebbing’s team, Professor Georgios Giamas identified a new cancer causing gene in 2011 and gained international acclaim. Called lemur tyrosine kinase 3 (LMTK3), this gene is new to humans, and is expressed more in cancer cells than in normal cells. In addition, those cancers that have high levels of LMTK3 are much more aggressive. Since this time we have been aiming to develop an anti-LMTK3 drug. This research has opened up many areas of promising investigation, and Professor Giamas is continuing this work in his dedicated laboratory at the University of Sussex, where he has been made a Professor. This work is still continuing very much in collaboration with Professor Stebbing and is partly funded by Action Against Cancer. Many patients respond well to initial treatment but then develop resistance to it – this is when, with currently available treatments, their cancer becomes much more difficult to treat. A potential anti-LMTK3 drug will be specifically designed to work in conjunction with a patient's existing treatment, and in a way that overcomes chemotherapy or hormonal therapy resistance, making the cells sensitive again. This would be an enormous step in the history of cancer treatment. Producing LMTK3 for the experiments we have been undertaking is very difficult and time consuming, as the ‘stability’ of the protein is not reliable. A lot of parameters therefore needed to be modified and tested. However, we have managed to produce an active form of LMTK3 protein under various conditions. Having finished a large drug compound screening with a frequently used generic assay, we have narrowed down the compounds from 30,000 to a handful, based on their ability to inhibit the activity of LMTK3. Additional experiments are now required to determine whether these drug compounds could be good targets against this gene as hoped. Moreover, we have generated new cancer cell lines that express higher levels of LMTK3 than normal cancer cells. We have confirmed the correlation between increased levels of this gene and increased cancer spread (metastasis), and have had some of these results published in peer-review journals. Using a variety of molecular and cellular biology experiments we wish to elucidate the signalling pathways that LMTK3 is implicated in and how this gene contributes to the increased ability of the cells to spread. The team made a huge breakthrough in solving the crystal structure of the cancer-causing gene LMTK3. This essential step towards drug development was achieved earlier than anticipated. Various further experiments are underway in order for this result to be scientifically proven. As there are currently no drugs that can overcome resistance to therapy, an anti-LMTK3 drug could, the scientists believe, allow the initial treatment to start working again. This would bring back hope to patients, and ultimately save their lives. 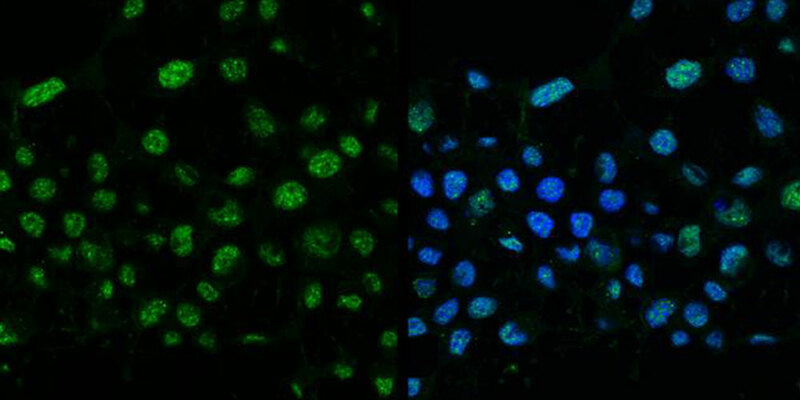 LMTK3 expression / localisation in breast cancer cells: green: LMTK3; blue: cell nucleus (Image: Professor Giamas).